Obviously, my main interest in the Census data is what it tells us about religion and spirituality in my adopted home. For anyone who’s been following the trends over recent years, there are few surprises here. But it’s still fascinating to look over the numbers, and to reflect on what it tells us about the spiritual state of New Zealand in 2013. The first table shows the number of respondents in each of the three previous censuses (1996, 2001 and 2006) alongside the percentage of total responses. I’ll leave you to digest those figures and analyse most of those trends for yourself. But far and away the most obvious – and, for me, the most important – statistics are the numbers identifying as ‘Christian’ and as ‘No Religion’. As recently as 1996, a strong majority of Kiwis still identified as Christian. Bible-believing Christians might want to point out that many of those 2,143,995 people from 1996 were ‘Christian’ in name only – a nominal description, perhaps indicating some loose connection to a mainline denomination rather than any personal faith in Jesus Christ as Saviour and Lord. But still, there was a vast gap between that 63% and the next most common category of ‘No Religion’, coming in at 25.5%. But since then, that gap has been steadily closing. As the number (and the percentage) of ‘Christian’ people declined, so the number of ‘No Religion’ people has been increasing. By 2006, the gap had closed to less than 20% of total responses. So what do the numbers from 2013 show? Well, you probably don’t have to be a statistician or a prophet to see this coming. Let’s remove the 1996 figures and add in the most recent data. Again, there are plenty of interesting patterns worth noting – the sharp rise in Sikh repondents, the steady increase in Hindu, Muslim and (to a lesser extent) Buddhist respondents, and the slight decline in ‘New Age’ respondents, to name a few. But again, what should really catch our eye are the top two lines. Total Christian respondents have dropped below two million, and below 50% of the population (I suspect the latter has never happened before). Meanwhile, the number of ‘No Religion’ respondents has once again increased dramatically, moving from just over 1 million in 2001, to just under 1.3 million in 2006, to well over 1.6 million in 2013. That represents 41.5% of the population. And remember, while there are plenty of nominals among the ‘Christian’ respondents, there is no such thing as a nominal when it comes to No Religion. When you tick that box, you mean it. At this point, it doesn’t take a genius to see where the trends are heading. Barring a large-scale change of course, New Zealand’s next Census will see ‘No Religion’ overtake ‘Christian’ as the nation’s dominant ‘belief system’. What does it all mean, and how should Christians respond? Let’s come back to that question in a moment. But first, we’ll look at the data on several of the mainline Christian denominations. Again, let’s begin with some recent history. Before you look at the statistics for 2013, take a second to predict what will happen. Now look below and test your powers of prediction. It’s really not that hard, is it? Anglicanism in New Zealand is taking on water at an alarming rate. Tragically, the ship is sinking. Almost 100,000 fewer people identify as Anglican in 2013, compared to 2006. In the last 17 years, the percentage of people self-identifying as Anglican has dropped from not much under 20% to not much over 10% of the population. I’ll come back to this later. Meanwhile, the Presbyterian / Congregational / Reformed trinity isn’t faring much better. Methodism is also in decline. Interestingly, though, Roman Catholicism has remained relatively steady, and the percentage of people self-identifying as simply ‘Christian’ has held strong. I won’t comment on Pentecostalism – partly because of my uncertainty about the figures (see footnote 6), and partly because I’d define ‘Pentecostal’ less denominationally and more theologically (so I suspect lots of people in other denominations are actually what I’d call Pentecostal in their belief and/or practice). All I’d say is that I’m a little surprised it hasn’t grown more (or at all). 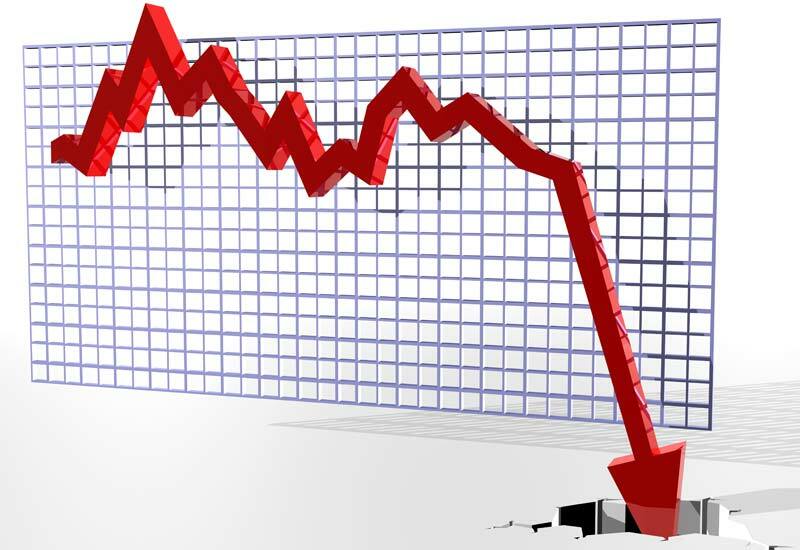 Here’s another graph to capture what’s going on. Given the overall decline of Christianity and the ascendancy of ‘No Religion’, the denominational stats are not exactly a revelation. But they’re fascinating (and, for some, confronting) reading nonetheless. So what does it all mean? How should Christians respond to the spiritual lay of the land as we look around this great nation? I’ll post some initial thoughts later, but would love to hear any reflections in the meantime. 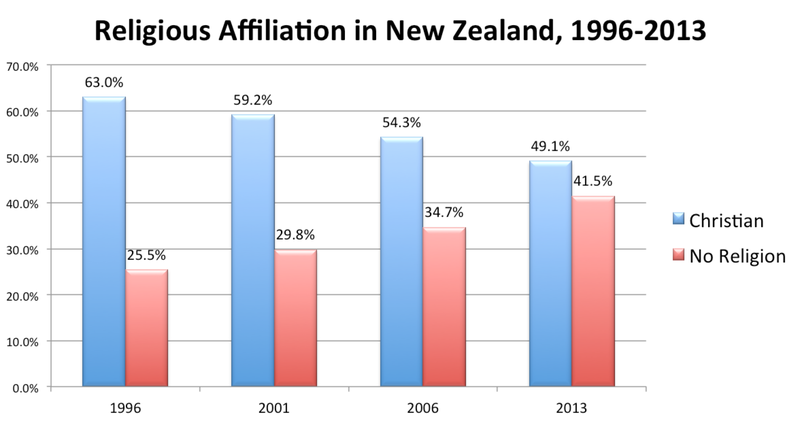 Statistics New Zealand groups ‘Presbyterian / Congregational / Reformed’ together. I don’t know why, and I don’t know what my Presbyterian, Congregational or Reformed friends would have to say about it. I’m too scared to ask! Statistics New Zealand refers to this as ‘Christian nfd [not further defined]’. For the record, though I’m an ordained Anglican minister (and a reformed evangelical! ), this is how my family and I self-identify on Census forms. 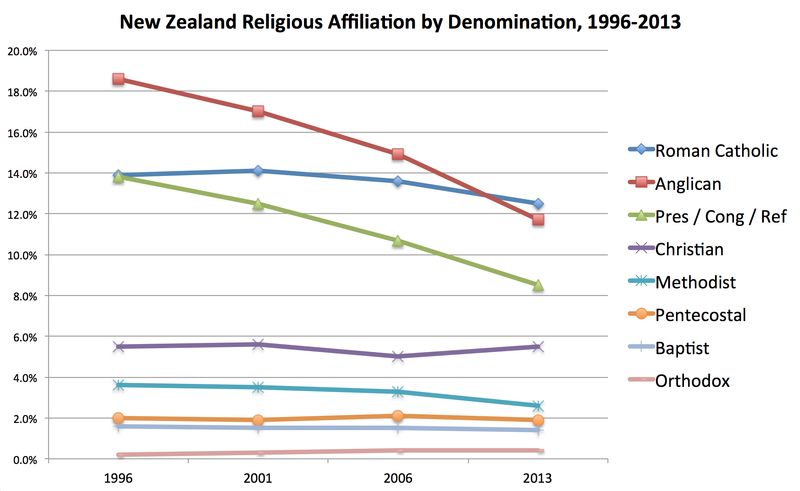 The Statistics New Zealand website says, “Of the largest religions, Catholic, Anglican, and Presbyterian all decreased, while Hindu, Islam, and Pentecostal increased” (emphasis added). As helpfully pointed out by William Chong (@wchong), the figures for ‘Pentecostal nfd’ (not further defined) increased from 36,372 in 2006 to 45,777 in 2013. However, when all Pentecostal denominations (eg: Assemblies of God, Elim) are combined, the figures in the table are obtained. Apologies for any confusion. Hi Geoff – thanks for presenting this new census data in this way, it’s helpful seeing the trends like this. Hi Mike, thanks very much for sharing, I appreciate it. The info you shared in your post is really helpful. Hi Geoff, this is Sam Anderson from Cornerstone Church (Nick referred this through on Facebook, and we met a few months ago!). I’ve been puzzled over the Pentecostal figure as well, and what I think they’ve done is added the ‘Born Again’ category in with Pentecostals. It’s the only explanation I can think of why they’d have it as increasing. I believe that Born Again has been counted as Pentecostal in the past, however from 2006 it was meant to be in its own section with Evangelical. Counting aside, I suspect that some who are theologically Pentecostal simply didn’t know what to tick (and perhaps just ticked Christian, or Protestant), since Pentecostal churches tend not to use that word in their official names. If it is declining though, well that’s a very interesting thing. Could it mean that growth in the bigger (and mega) individual Pentecostal churches is masking actual decline in the movement? Are the smaller ones being cannibalized by the bigger ones, with adherents just moving from one church to another? Is our culture beginning to look past Pentacostalism too, despite its claims to relevance, just as it has done with the mainlines? Sorry to open that can of worms, but that was my initial train of thought. Hi Sam, thanks for your thoughts. I’m not totally sure, either – but regardless of why, it’s definitely interesting. Things might become clearer once SNZ shares some more detail (or once I get time to dig around a bit more and figure it out!). I think your questions are good ones, and worth some more reflection. I’ve amended the footnote above, based on an insight William Chong shared with me (about ‘Pentecostal nfd’ increasing, while other groups that are counted together with Pentecostal for an overall figure might have declined). 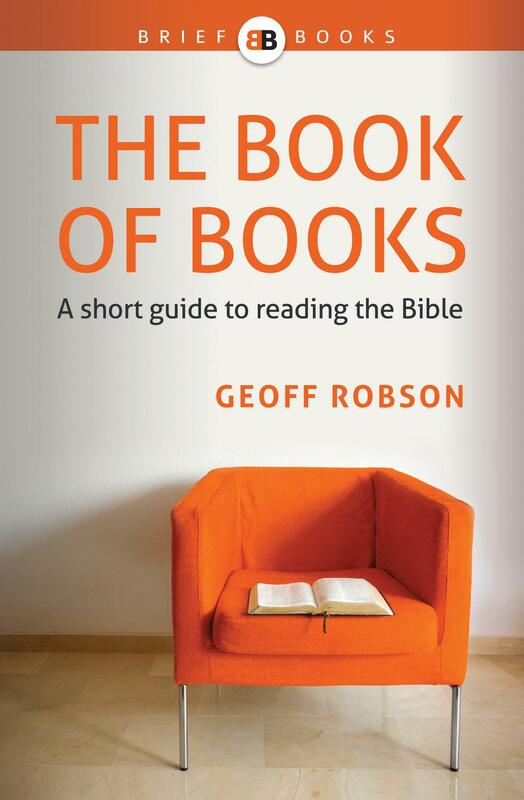 If you’re a clergyman and you write, ‘ though I’m an ordained Anglican minister (and a reformed evangelical! ), this’ [= Christian nfd] ‘is how my family and I self-identify on Census forms’, then it’s weird that you also write, ‘Anglicanism in New Zealand is taking on water at an alarming rate. Tragically, the ship is sinking.’ What, it’s sinking because even the clergy don’t admit being Anglicans on their census forms?